Tips and tricks: Maintenance – tighten the output jack – Play UBass! Here’s a little quick tip for every Ubassist that plays any of the acoustic/electric models. 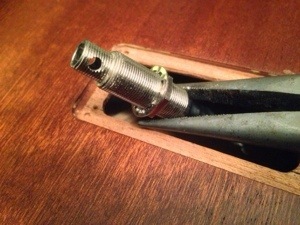 If you use a strap the output jack can sometimes unscrew itself and become loose. To avoid further problem it’s important to solve this problem quickly. If not you can run into more serous problems with the output jack maybe even break the cable from the piezo pickup! Here is a little guide how you can fix this! If you’re not comfortable doing this yourself please let a professional repairman help you out! 2. Loosen the actual strap button. Be careful so you don’t turn the whole output jack. This might break the cable that comes from the piezo! 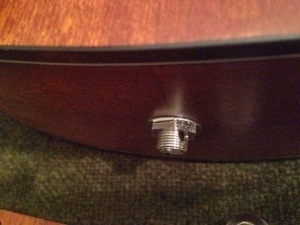 Through the open hole you can hold on to the output jack to prevent it from turning while you loosen the strap button. 3. While still holding the output jack tighten the nut with a proper tool. 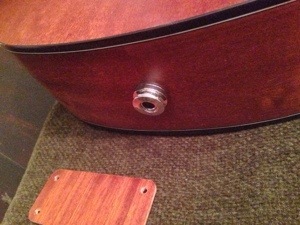 If you can’t tighten the nut enough you might have to make even further adjustments. If you unscrew the nut you can remove the output jack and change the location of the fixed nut to shorten the thread length on the tip of the jack. Make small adjustments to find out the best position of the fixed nut. 4. 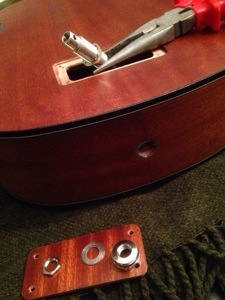 Now fasten the nut and then the strap button while still holding the output jack through the opened back cover. 5. Put the back cover back. Any tip for the Rumbler, which has no cover? If you don’t need to change the nut inside the body and the output jack looks like the one I have you can try to use the hole. I mean the hole that goes through the output jack. 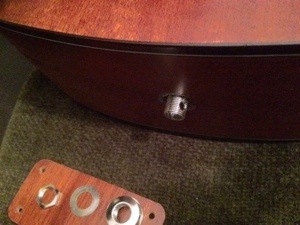 If you put something small (like a small screwdriver) through that hole you can then try to tighten the outer nut. Hope this can help you solve your problem!